The Mitsubishi Pajero Owners Club® :: View topic - Ryka's Cafe, Box Hill, Surrey. Posted: Mon Aug 29, 2016 15:30 Post subject: Ryka's Cafe, Box Hill, Surrey. Wednesday 31st August. 7pm - 9pm ish. Ryka's Café stays open late on Wednesday evenings during the summer. Always a good selection of bikes & cars down there. I'll be down there from 7pm-ish. If anybody else is interested for a coffee & a chat, I'll see you there! Posted: Mon Aug 29, 2016 15:30 Post subject: Google Ads keep the POCUK free to join! 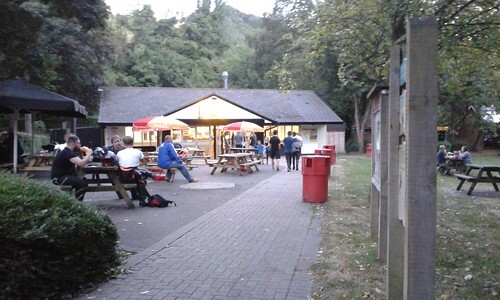 Posted: Mon Aug 29, 2016 20:38 Post subject: Re: Ryka's Cafe, Box Hill, Surrey. Ryka's café is definitely a bikers place on any Sunday. They do have other car meets on Saturday's though. As long as they are making money, any vehicle is welcome. I used to blast my Jap motorbikes around the Mickey bends in the late 80s, early 90s. Anybody interested in meeting here on a Saturday morning for a coffee & a chat?.....If so let me know and I'll try and organise a meet at Ryka's. Hi Chappy808, did you finally rock up for a meet at Rykas cafe? It's a long time since I was there but we used to lunch regularly in the Burford Bridge Hotel and the pub at the top of Box Hill. There's a good lunchtime pub near Westcott along the A25. 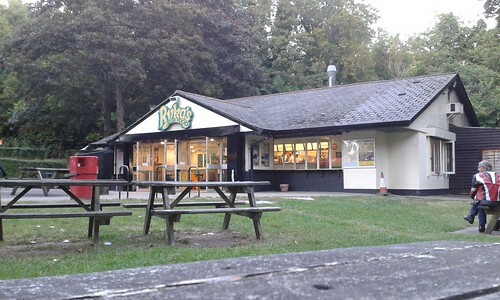 When I used to conregate in the '60's in the layby on the northbound carriageway there was no Rykas cafe as that was a much later addition. A few years ago we used to go for a Honda CBR blast on Sundays and meet at Whiteways cafe at the top of Bury Hill and sometimes a rideout along the A272 to Petersfield for breakfast on the square. I still run the Honda CBR but may change it back to a Ducati Monster S4R for hooning around here. Now at 71 I'm getting a bit 'aged' for biking but I might as well keep going as long as possible eh. No one on here seems interested in meeting up at Ryka's for a coffee & chat meet. Shame really, but hey-hoy that's the way it goes I suppose. I've been down there a few times amongst the bikes & motors on a Saturday afternoon. I know Whiteways Café at the top of Bury Hill. It's still the same there. Another good meeting place for bikers, cars, etc. I used to own a Honda Goldwing, Bury Hill was a nice place I visited quite often before travelling onto the South Coast. Enjoy your two wheel fun while you can matey over there.